Kaveri Ponnapa, author of The Vanishing Kodavas, recalls in one of her earlier articles on Coorg, “Most women of my mother-in- law’s generation who lived on coffee plantations never set out on a stroll without the equivalent of the Russian avoska, the ‘maybe’ or ‘perhaps’ mesh bag—you never knew what surprise the season would throw your way." Several ingredients are unique to these parts. Like kachampuli, the dark vinegar made from the concentrated juice of the garcinia gummi-gutta fruit (called panapuli locally), which adds a sour kick to pork and fish dishes. And the famous Coorg honey, from wild roses and forest blooms, which locals drizzle on akki ottis or rice rotis, and eat with ghee for breakfast. Naveen Alvares, executive chef at Evolve Back Chikkana Halli estate, attributes this love of indigenous ingredients to Coorg’s unique geography and culture. “Kodavas, who make up most of the population, are ancestor worshippers and eat what is available off the land. Most have a plantation background or a sacred forest, so the connect with the land is very strong," he says. Several exotic edibles are to be seen, many of them unconventional in the Indian context. As I stop to admire the bizarre artistry of a passionflower, Alvares smiles, “This is what makes Coorg special. It’s wildness." I drive down from Siddapur to Madikeri the next day. The hour-long journey is jaw-droppingly scenic. Acre after acre of coffee planatation presents itself, occasionally punctuated by the whoosh of a waterfall or the brilliant blue of a kingfisher. A treasure trove of mushroom diversity, the Western Ghats are home to 750 species. Edible fungi known as kummu grow wild on Coorg’s hills and are highly prized for their exotic flavour. Vancouver-based blogger Shalini Nanda Nagappa mentions several varieties in her blog, A Cookery Year In Coorg—“feathery, delicate nucchi kummu and kokkalé kummu, succulent aal kummu, the giant nethalé kummu,..and the decidedly meaty pandi kummu." Muthu Bopanna, who runs a heritage homestay called Gowri Niwas in Madikeri, is used to seeing them on her 70-acre coffee estate, giant ones as well as beautiful tiny ones that look like a bed of white flowers. “Our workers gather the edible ones and bring them to us. Though a tad difficult to clean, they’re absolutely delicious and totally worth the effort. The taste, reminiscent of oyster mushrooms, is totally different from button mushrooms," she says, as we chat over coffee and chocolate cake at her home. 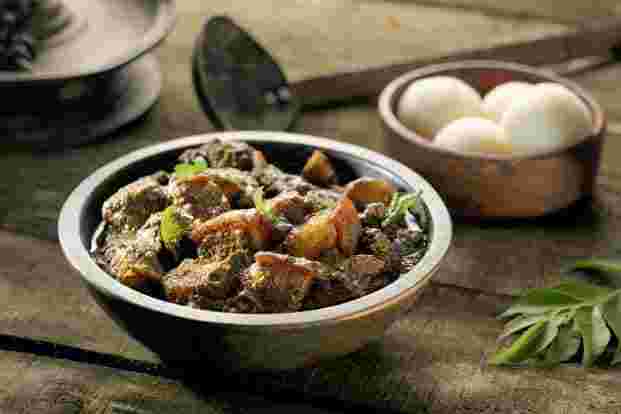 To put pork’s near sacred place in Coorg’s cuisine in context, Kumar narrates a colourful legend. When Parvati expressed a desire to see Arjuna’s back (the great warrior never showed his back—a sign of weakness—during war) Shiva disguised himself as a hunter and shot a wild boar that Arjuna’s arrow had pierced. An altercation followed. As Arjuna fell over his opponent, his back was revealed, granting Parvati’s wish. A shower of flowers fell from the heavens and the pork was distributed as prasad to the hunting party. The yarn illustrates the extent to which Coorg’s geographical seclusion has shaped its unique cuisine. “While we Coorgs treat pork as prasad and offer it to our ancestors during rituals, it would be considered blasphemous to go anywhere near pork in neighbouring Mysuru," Kumar laughs. During mid-monsoon, on the 18th day of a period known as kakkada, Coorgs pick the leaves of a wild plant called madd thoppu and extract its juice to make a payasam. Megha Deokule, who runs a homestay in Madikeri and conducts foraging experiences for her guests during summer and the monsoon, rues that foraging in Coorg is somewhere getting lost due to the abundant availability of vegetables from the nearby towns and the increase in tourist footfalls. An avid cook who loves to use local ingredients, she adds two more greens to my thoppu lexicon: amruta balli, known to cure urinary tract disease and improve immunity, and doddapatre or Mexican mint, useful in treating measles. The bustling Friday market in Madikeri is chock-full of these supergreens and more. Kembe (colocasia leaves) and kaipuli are up for grabs as are spices and meat. Walking around, it becomes abundantly clear that Coorgs are not just master harvesters, they’re also skilled at altering foodstuffs for preservation by yeast and bacteria. A huge assortment of jams and pickles made from the spoils of the land lines the local stores. Everything is home-made and unbranded. The innovative use of native ingredients is also evident in the many feisty pajjis (chutneys) that show up at every meal in Coorg. The late Ranee Vijaya Kuttaiah’s book Cuisine From Coorg, which I pick up at the resort’s gift shop, lists several delicious recipes: elli (sesame) pajji, citron pajji, cucumber pajji, horsegram and coconut pajji. Wild foods, which grow in their natural habitat without fertilizers or pesticides, don’t deplete the earth’s resources. And they taste incredible.What if we, like Coorgs, thought of the forest as our pantry? Let’s tap into our vast underutilized permacultures and support the foragers who gather these ingredients. Let’s showcase our native treasures at the finest restaurants through dishes that startle with their newness and intensity.